So to review the video chat, I first have to talk about the whole interface, and that has about 6 hours of prologue occurring across 4 years of cinema informing it. So let’s start, as I do with almost every interface, simply by describing it and its components. The Iron Man is the name of the series of superpowered exosuits designed by Tony Stark. They range from the Mark I, a comparatively crude suit of armor to escape imprisonment by terrorists, through the Mark XLVI, the armor seen in The Avengers: Age of Ultron. The suit acts as defense against nearly every type of weapon known. It has repulsor beams built into the palms and in later models the arc reactor mounted in the chest that can be used to deliver concussive force. It allows the wearer to fly. Offensive weaponry varies between models, but has included a high powered laser system, and auto-targeting minigun pod and missiles. The suit can act semi-autonomously or via remote control. One of the models in The Avengers has parts that are seen to self-propel to Tony, targeting a beacon bracelet he wears, and self-assemble around him very quickly. Though Tony’s head is completely covered, he has a virtual reality display within his helmet. It is a full-field-of-vision, very high-resolution, full-color display that provides stereoscopic imaging. It allows Tony to see the world around him as if he were not wearing the helmet, augment the view with goal-, person-, location-, and object-sensitive awareness. The display varies a great deal, changing to the needs of the situation. But five icons persistently in the lower part of the display seem to be: suit status, targeting and optics, radar, artificial horizon, and map. An interpretive view of Tony’s experience, from Iron Man (2008). 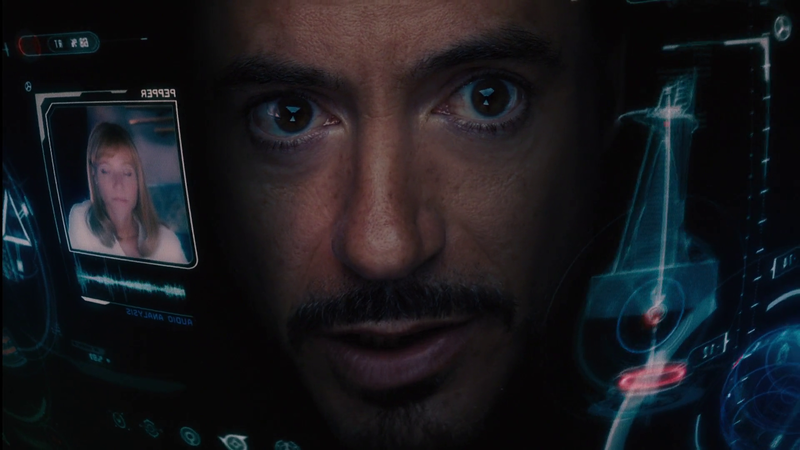 An first-person view from within the HUD, Iron Man (2008). There is much to critique about the readability of the complex layering and translucency, the limits of human perception, and the necessarily- (and strictly-) interpretive nature of what we as audience see, but let me save those three points for a later post. For now it’s enough to log the features as aspects of the system. Though Tony could use his hands to interact with an interface projected into the augmented reality view around him, his hands are often occupied in controlling flight or in combat. For this reason the means of input are head gesture, eye gesture, and voice input. A bit more on each follows. Elements within the HUD such as reticles around his eyes follow and track his head gestures. Other elements stay locked in place. The HUD can track his gaze perfectly, allowing him to designate targets for his weapons with a fixation. 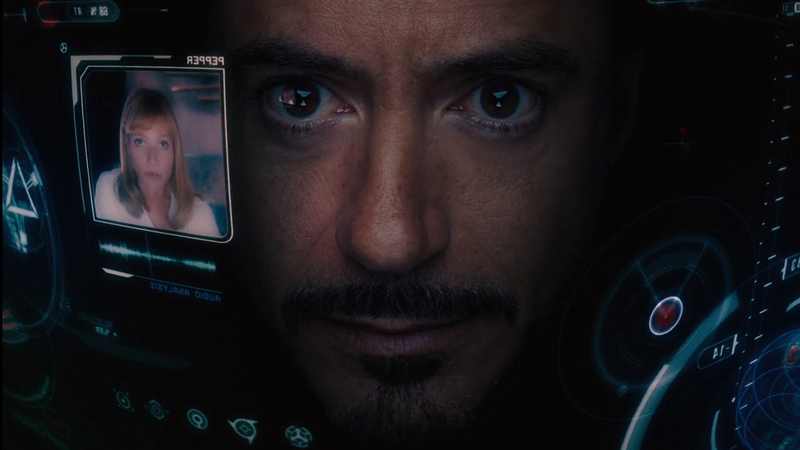 Using this perfect eye tracking, Tony can also speak about something he is looking at, either in the real world or in the interface, and the system understands exactly what he’s talking about. An on-board artificial intelligence known as JARVIS handles any information task Tony asks of it, and monitors the surroundings and anticipates informational needs. There is strong evidence that most of the functions of the suit are handled by JARVIS behind the scenes. The crucialness of the artificial intelligence to the function of the suit cannot be overstated. It’s difficult to imagine how most of the suit could function as it does without an artificial intelligence behind the scenes facilitating results and even guiding Tony. With this in mind it is instructive to reframe the AI as the thing being named the Iron Man, with Tony Stark being an onboard manager, or, more charitably, a command-and-control center. Who quips. Next up in the Iron HUD series: Lets review the functions of the suit. This entry was posted in Iron Man (2008), The Avengers (2012) and tagged artificial intelligence, augmented reality, best of, exosuit, eye tracking, gesture, head gesture, immersive display, Iron HUD, Iron Man, natural language, natural user interface, NUI, strong artificial intelligence, voice command, voice input, voice interactions, voice interface, weaponry. Bookmark the permalink. Hey man, that quipping part is pretty tough work when people (or monsters, or evil robots, or…) are trying their damnedest to straight up kill you. Takes a lot work to be witty under fire. I mean once you let the AI do that, you might as well stay home and be boring old business tycoon while your robo-powersuit pal fights crime and has cool adventures with your former bestest friends ever since I saved Earth. What impresses most is the HUD and its level of precision . There is another form of interfacing that you haven’t considered: direct neural interfacing. We know the technology exists in the MU (witness Winter Soldier’s cybernetic arm, for example). The HUD may act as an information “consciousness guide” (awkward term, but best I can come up with), calling data out for Tony’s attention but his responses may be “read” directly from his brain/nervous system via a “trained reflex” methodology. This wouldn’t be the first time such a scheme would be in the movies, btw. That honor would go to “Firefox”, with the MIG’s neurally-activated rear defences. To bastardize a quote. What does a neural interface need a HUD for?